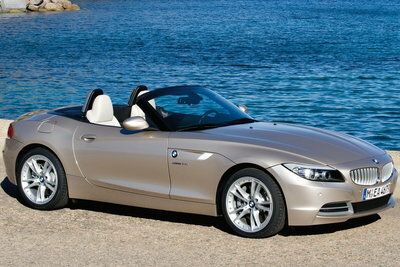 The Z4 is a small rear-wheel-drive convertible with seating for two. Now in its third generation, the Z4 wears more refined styling and offers a slick hardtop convertible to broaden its appeal. The Z4 sDrive30i features a 3.0L inline six cylinder engines rated at 255-bhp mated to six-speed manual and automatic transmissions. The higher performance sDrive35i model features a turbocharged 3.0L six rated at 300-bhp and offers a 7-speed sequential manual in lieu of standard automatic transmission. The Z4 and Roadster is manufactured in the U.S. in South Carolina. A major update to the Z4 appears for 2009. The third generation Z4 wears all-new styling outside and in. The defining feature of the updated Z4 is a retractable hardtop convertible, which should broaden its use and appeal. The new model is 5 inches longer and has 1.5-inch wider track, but essentially unchanged in height or width. Like other BMWs, two inline sixes are offered in the oddly named sDrive30i and sDrive 35i models. Power has increased by 40-45 bhp in the two models. The sDrive35i now offers a 7-speed dual clutch automated manual in lieu of a conventional automatic transmission.